As you sit down to write the piece, take your time. Ask family members for help with dates or names, should you be unclear about any of them. You do not want to insert incorrect or error-filled information. Gather a few recent copies of your local newspaper, and peruse them to learn how the obituaries are written stylistically. If you are having a funeral home handle the arrangements, it is likely the director will write the obituary, which is then processed and distributed to local newspapers for publication. However, if you want or need to write an obituary for an out-of-state newspaper, memorial website or funeral program, you will need to know what information to include. The funeral director can also help with this. The funeral director may also be able to you if there are any fees associated with writing up the obituary as well as a specific length. Get a copy of the person’s resume or curriculum vitae to gather information on his or her professional life and accomplishments. Talk to family members, friends and colleagues as you collect personal information. Verify spelling of relative’s names and towns where the deceased lived. It is always better to have more information then you will need than not enough. Using the above information, write the obituary following the newspaper’s guidelines. If you’re at a loss after viewing several of the existing obituaries in the newspaper, you can use an obituary funeral template. Type and print a copy of the obituary, and keep a hard copy saved on your computer. Double space between lines for easy reading. Don’t use a fancy font or colored ink. Simpler is better in this case. It is very easy to miss your own mistakes. Having another set of eyes on the copy will help prevent any unforeseen errors. If possible, have another family member or close friend proof the obituary for you. Double check the spelling of all names and professional affiliations. Read the obituary aloud to check for flow. If you would like to include a photograph of the deceased person, make sure you select one that is not only flattering, but also lets the person’s true personality shine through. Again, double check with the publication or funeral home director about photograph size recommendations. Submit the obituary and photograph as outlined in the publication’s guidelines. You’ll need to do it in a timely manner so people reading the newspaper will have the information they need about funeral services and memorials. Typically, you will need to submit an obituary by the publication’s afternoon deadline time for it to run in the next printing of the paper. Normally, you will only have a day or two to gather information and write the obituary. Don’t delay in doing this task. If you find yourself overwhelmed, request help from other family members or friends. Once the obituary is published, you can keep a copy in a scrapbook along with other photos, awards and information about the deceased person’s life. Some like to include a poem or a verse or two to show sentiment. While there are standard obituaries that are more factual than sentimental, you can choose to share some emotion within the piece. Remember that an obituary, like a funeral, is for the living. 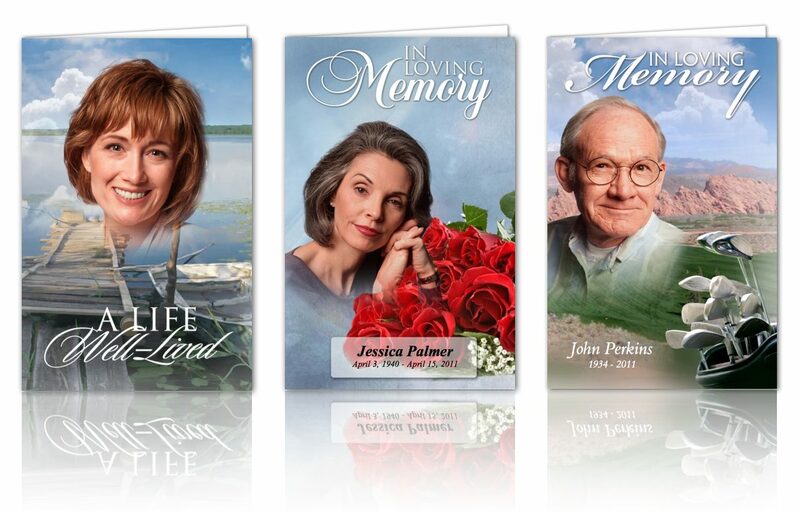 You want to portray the deceased in a good light for those who continue to live with his memory. De mortuis nihil nisi bonum is Latin for speak kindly of the dead. This is always a good practice to follow as you ponder on how to create an obituary funeral programs. Whether using a simple obituary or writing a more comprehensive review of the person’s life, an obituary serves as a printed tribute to someone who has died. Using the above steps, you can create an informative and respectful tribute. See this video that how can you design obituary program for a passed person. here you can change everything like: background image, photo, custom text, poems, the order of service etc. We provide you best plate form to build your own program your self.